Karl Fulves published in Pallbearers Review an unsolved card problem wherein an Ace having the same suit of a previously selected card changes into that selection. The puzzling aspect of this problem was this: The four Aces are shown, mixed, and tabled face down. Nobody knows the order or disposition of the Aces, not even the spectator. Jon describes eight solutions each with its own trade-offs, strengths and weaknesses. 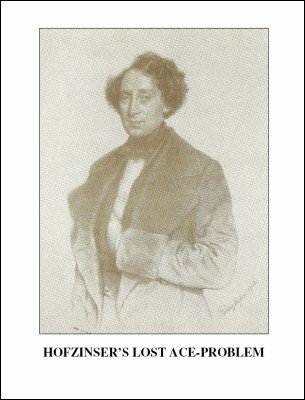 The Hofzinser Lost Ace Problem is a good example of a card problem that intrigues magicians because it lends itself to "creative noodling" and "brainstorming by committee." The challenge, which is also great fun, is to discover the nature of the trade-offs accepted, the number and kind of prices paid, the type of weaknesses revealed, and the unexpected subtleties that are often uncovered in the process. The EFFECT (as far as lay people are concerned) is not always mind-blowing or artistically satisfying, but the problem-solving process affects creative magicians. It improves how we approach and think about magic, and this has a lasting effect and affect. Also Roberto Giobbi is a strong supporter of this kind of 'academic exercises'. Not every version or solution you develop should be performed or even presented to other magicians. But the exercise to flex your magic muscle and think creatively about solutions will make you a better magician as well as is a fun and rewarding work in and of itself. 1st edition 2007, 15 pages.